This is a post about a recent paper by Olšovská and co-authors looking into the characteristics of ~100 year old bottles of Czech lagers. These beers had been discovered at the site of an old brewery during construction and based on the nature of the found beers, they had (presumably) been stored under fairly ideal conditions. The researchers took advantage of this fortuitous discovery to note the characteristics of the aged beers, as such an opportunity to test 100 year old beer does not come by very often, and to try to learn about what the beers may have been like originally. Here is a quick summary of some of the findings with a focus and further thoughts on one of the three samples which the researchers described as "resembling lambic". They make this comparison, which is what brought the paper to my attention, due to the properties of the finished beer and the presence of Brettanomyces. As with trying to understand such old beers with minimal data, there is a fair amount of conjecture involved in this discussion. Acetic acid and lambic-like lagers? A comparison of a ~100 year old Czech beer and various lambics. While I found this paper rather interesting, I think the authors were mistaken to say the beer resembled lambic. Since it was brewed as a lager, we can be sure that it did not follow lambic-like brewing process in some pretty fundamental ways. Putting that aside and only looking at the parameters of the beer, it is also rather unlike lambic. A comparison between the 100 year old Czech sample and various lambics is shown at right. A necessary caveat here is that I am not comparing to 100 year old lambic. I have data from lambic from ~100 years ago (see the notes regarding these data in this blog post about Duivelsbier), a sample of 1970s atypical lambic (to try to approach the acetic acid and acetic:lactic acid levels in the Czech beer) and data from the oldest bottled lambic I could find - ~17 years old. These are all a far cry from ~100 years in the bottle, but, as reasoned below, I think they are sufficient to say that the comparison is not accurate. The first part that jumped out at me was the very high acetic acid in the beer and comparatively low lactic acid. Assuming there is no typo here, this acetic acid level is at least 4 times higher than I have seen for normal lambic or gueuze. The lactic acid values of the lager are in line with some lambics, but not with data available for aged lambic. And it is surprising to me that the acetic levels are three times higher than the lactic levels in the Czech beer. Meanwhile, with lambic, I haven't seen a beer where that ratio of acetic:lactic is much over 1:1, and generally it is much lower (closer to 0.1). The values of ethyl acetate and the comparison of ethyl acetate to ethyl lactate shows the same trend. 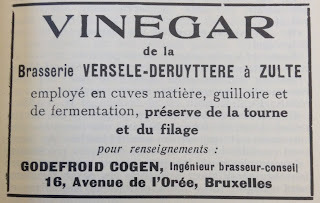 An add for vinegar to add to beer or wort from PJB 1922. So it seems that the aged Czech beer went though some sort of assertive acetic production, through either acetic acid bacteria or Brettanomyces in the presence of O2, that isn't found to a comparable degree in lambic. And therefore the beer neither resembles lambic brewing process nor the final characteristics of lambic. While this doesn't reflect lambic, I think it is interesting to note the acetic presence in this one sample of the Czech beer. It is possible that this developed in the bottle, but that is a lot of acetic acid! Modern distilled vinegar has only about 5x more acetic acid than this beer, compared to about 50-100x more acetic in vinegar than in modern lambic and Flanders red beers. If the acetic developed in the bottle, that would likely require a dramatic failure of the seal sufficiently early on such that the brett and/or bacteria present were still viable. This should then also result in some major changes to the beer (like it evaporating away over 100 years) and therefore I don't think this is likely the source of the acetic. So I think it is reasonable to assume that at least a good chunk of this was present in the beer before bottling. And, therefore, that the brewers knew about it and bottled the beer anyway. The intentional bottling and (presumed) selling of acetic beer (that may or may not have much lactic acidity), occurred at this time in regions of Belgium as well and I think this is an interesting piece of beer history (though, again, I don't think it would have been common for the acetic levels to be quite so high). 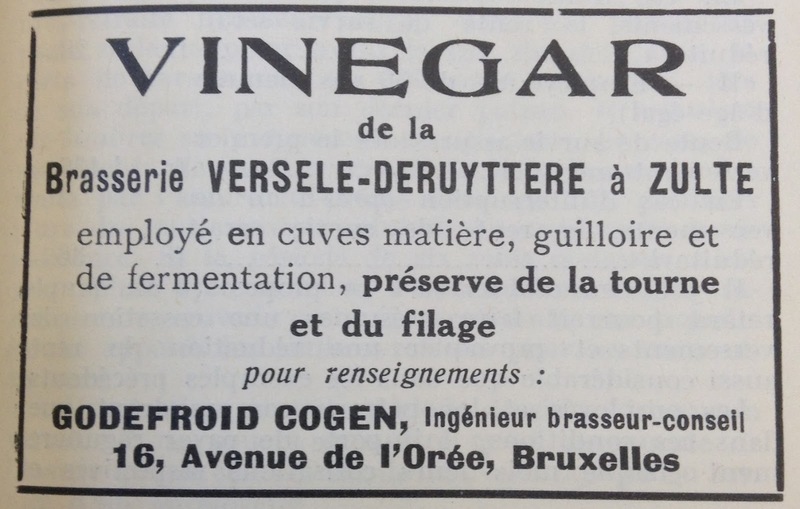 An ad for vinegar for blending from Petit Journal du Brasseur, 1924. Moving on to a focus on lactic acid, all three ~100 year old Czech beers tested had lactic acid levels which are comparable to modern acidic beers (2500-3500 mg/L). This is a good deal above what you might get from malt and I found it to be a pretty cool part of this paper. It made me wonder about how much lactic acidity was in the beers when they were bottled compared to how much developed in the bottle over time. 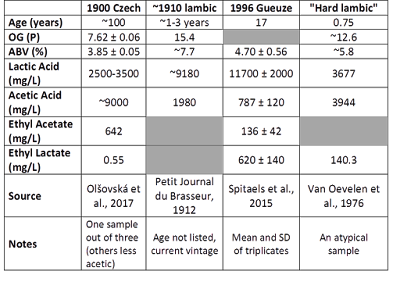 Spitaels et al., 2015 (discussed in this blog post) showed aged bottles of Cantillon gueuze have considerably more acidity than fresh bottles. As discussed in that post, it is hard to tell how much of this difference may be due to aging compared to changes in brewing/aging/blending process which might yield less acidic beer. But, if even half of the difference is due to development in the bottle, the level of lactic acid noted in the Czech beers could develop within a 5-10 year time frame from bottling. So, with this assumption, the levels of lactic acid in the Czech beer are consistent with a perceptibly clean beer being bottled. Therefore, perhaps the beers seemed lactic-free when they were consumed and it only showed up in these aged examples. But I don't think it can totally be ruled out that there was some present at the time of bottling and that fresh examples of the beer may have shown this. The presence of brett, by detection of Brettanomyces bruxellensis DNA, was noted in the sample which was compared to lambic. I found this interesting given the transition to 'clean' lagers around 1900, while ales were still mixed culture beers (even if brewers wanted them to be clean). I don't think much about historic lagers with brett but I think it would not be unreasonable that it was likely present in some and, depending on temperature, could have made a flavor impact. Brett can grow at 15 C (see the MTF wiki here) and likely cooler. I know that lambic cellars can spend a good part of the year cooler than this and lambic seems to still show biological developments over this time. So I think it would be interesting to learn about historic lagers with a brett presence. There are certainly examples of brett in lagered beer added for a secondary fermentation. Some of the early tests with Brettanomyces resulted in the development of 'English' flavor in lager beer. These were used to help identify brett as the organism responsible for this flavor. And there are plenty of modern beers which start their lives as lagers and after further purposeful pitching become mixed culture beers. I'm more interested in the natural development of brett characteristics in lager beer as it is aging, such that the final beer would be lager-like except with brett rather than initially a lagered and then warmed and pitched with brett. I know that Clausen, in his patent for brett, noted that it would not impact the flavor of lager even after multiple months at lager temps, so it could be that only warmer lagers or packaged lagers that were stored warmer for some time before consumption would start to show this character. Given the range of lager production I think it would not be surprising to find that some regions, possibly where lagering was conducted a bit warmer in pre-refrigeration days, may have had lagers showing brett character. I don't think this would have been common by any means. But perhaps a rare regional phenomenon much like Orval surviving as a brett beer (albeit an ale) to the modern day. There's definitely other interesting stuff in the Olšovská et al. (2017) paper but I think this is enough for one post. To sum up, most of my lingering thoughts about this are fairly unanswerable (mostly to the effect of: what did the beer taste like when it was young?) but I think some of these questions would be interesting to approach with modern brewing. Brett was able to get into one of these three bottles. At the latest, this would have come at bottling/in the bottle. From the acetic discussion above, I think there was at least some acetic-producing organism before bottling (but, of course, that assumption couple be completely wrong and this could have developed only in the bottle). Any earlier, and brett would have been present in the trub and possibly in the repitched yeast at the brewery. If it is present in the repitched yeast at the brewery to an appreciable degree, than maybe it is active in the fermenting and aging beer, and maybe it is making an impact. So plenty of questions for the future. But overall I think it is possible that lagers, at least during a certain time frame and in certain areas, were not always as 'clean' as we consider them to be. Edit 12-June-2017: I've been thinking this over throughout the day and I am not thinking there may be a better chance that the acetic could be all or primarily generated after bottling. I'm still pretty unsure about it and the above discussion (that I think it would take a significant failure in the cork to general that much acetic) holds. And, if that happened, then I would expect this to be reflected in fill heights, which would then be apparent in the un-opened beer. The authors don't note fill heights in their paper so we can't really tell here. My thinking that is swinging me more toward a bottle issue is that this is a lot of acetic acid. To a degree it may be more like vinegar than typical acidic beer. And I am having a bit of trouble thinking of why such a beer would be bottled (at least if it were intended to be a clean lager, which is the premise that the authors seem to be operating under). Anyway, I am content to settle with we'll never know. And I am still pretty split on where I think the acetic was generated. But the root question this prompted still holds - were there beers of lager fermentation which displayed brett characteristics with any sort of regularity? And, if so, where were these beers found and how long did they last?